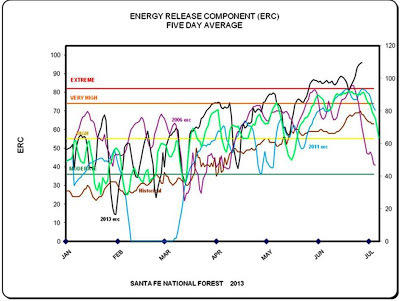 Energy Release Component (ERC) measures the available energy of a forest fire. 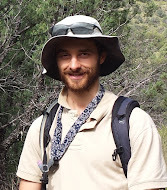 The number represents the potential heat release, based on the dryness and amount of fuels present. An updated (as of 6/27/2013) chart shows that, even compared to previous drought years, this year's ERC continues to hit record levels. It is worth noting that yesterday was the two-year anniversary of the Las Conchas fire, which burned more than 44,000 acres in 13 hours, or about an acre a second! 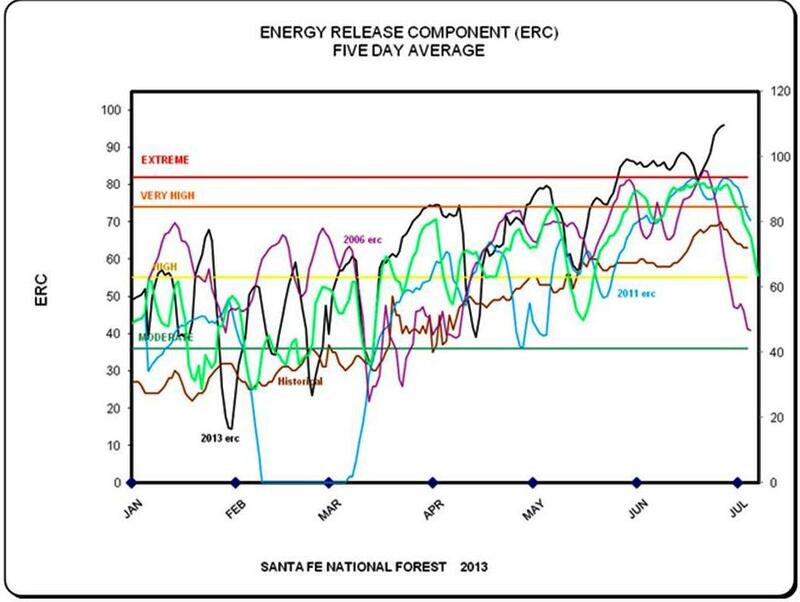 The blue line for 2011 shows that the ERC during that time was only 80-90% of current ERC values. The Las Conchas fire burned so explosively that fuels were preheated and vaporized ahead of the actual fire front. These superheated gasses then burned several hundred feet above the canopy fire. Under such conditions, there may not be "defensible space," as all-metal structures in the middle of clearings were destroyed by the burning gases.